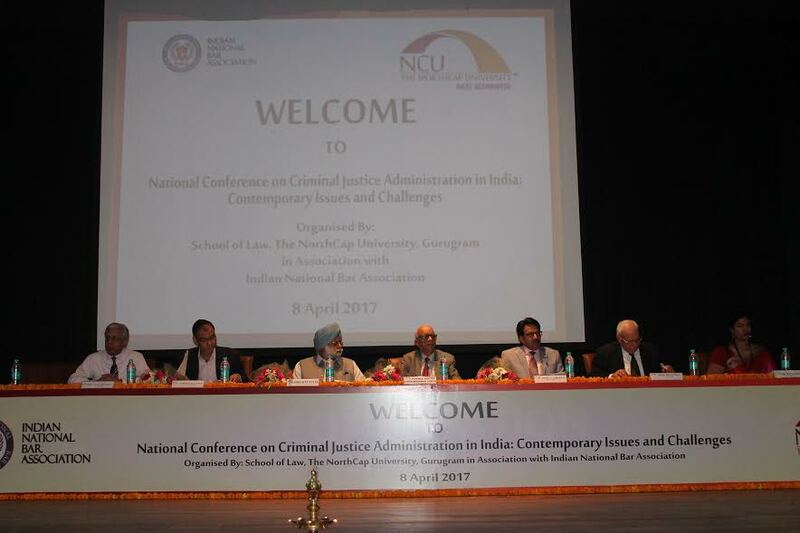 New Delhi: School of Law, the NorthCap University in collaboration with the Indian Bar Association organized a ‘National Conference on Criminal Justice Administration in India: Contemporary Issues & Challenges’ on April 8, 2017. Eminent dignitaries from the legal fraternity such as Justice Vidya Bhushan Gupta, Former Judge, Delhi High Court, Prof. (Dr.) G.S. Bajpai, Registrar, National Law University Delhi, New Delhi and Sh. KTS Tulsi, Senior Advocate, the Supreme Court of India were present during the Inaugural Ceremony to grace the occasion. More than 100 participants were present at the conference. Students, faculties and professionals from various law universities and colleges including Jamia Milia Islamia, Symbiosis, Amity university, National Law University, Assam were present.